"Dad, when I grow up I want to be a fighter pilot." "I'm sorry son, you can't do both." If you're a fighter pilot, working to be a fighter pilot, hoping to be a fighter pilot, wish you could be a fighter pilot, like to be around fighter pilots, read about fighter pilots or admire fighter pilots; you're at the right place. and continuous erosion of our fighter pilot traditions and background. We believe the fighter pilot was, is and always should be a special breed, feared by many, revered by all. 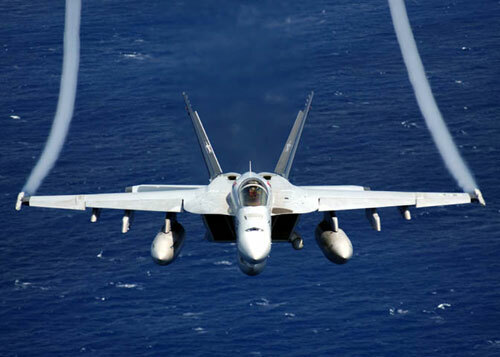 We believe in the dominant skill of the fighter pilot in just about every endeavor; flying, drinking, winning arguments (on any subject) and well, just plain being superior. Being a fighter pilot is an attitude. It's an attitude of knowing you can accomplish any task presented to you. Even if you know nothing about the problem or issue in front of you, you know that running through the wall head first will probably get you started in the right direction. If you have that attitude or want to get it, whether you're a flyer or not, take a look at our totally off-campus, self-taught curriculum. We offer thoughtful courses in such areas as "Don't let your politically correct, rank conscious superior steal your soul," or "Drinking and being present at the bar on Fridays as it relates to your real job...in our case, flying" and many, many more. If you feel as we do, if you enjoy everything fighter pilot, take a look at our web site and have a chuckle, we guarantee you, we will. Some of the stuff on our web site may contain explicit language. Many of the stories, songs and jokes about fighter pilots were created by men while they were in far off places, flying combat missions, looking for ways to relieve the tension of war. Living on the edge brings out strong verbal expression. We'll try to warn you, with the banner below, when strong language is present. When you see the banner, and uninhibited language offends you, that song, narrative or joke may be one you'd prefer to pass on. By the way, if you'd like to meet us, we're in The Bar. If you're a previous subscriber, log in with you e-mail to re-set your password. Once you do that, you can log in and make comments real time on any write up on our site and start a blog with other subscribers. If you are new to FU, just click on "Subscribe" and register your e-mail with us. You can also add a picture/logo for your user name. Tell all your bros about FU and take the survey below. Check Six! Is FU preserving fighter pilot history, traditions, and spirit?